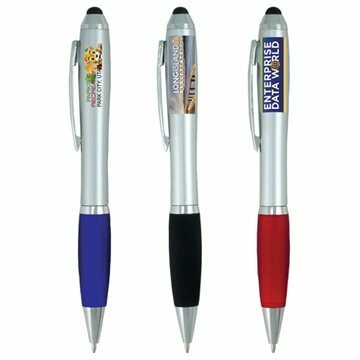 Stylish twist action ballpoint pen with soft rubber stylus tip for use with all your touch screen mobile devices such iPad®, iPhone®, Galaxy®, Nexus®, Surface® etc. The product displays the logo exactly as hoped for! The color and style of the product was exactly as Alicia said it would appear. After comparing prices, I decided to purchase with AnyPromo.com. Clients loved them. It turned out awesome. Much better than I expected. Good product, and good price on these. The printing doesn't wear off over time.